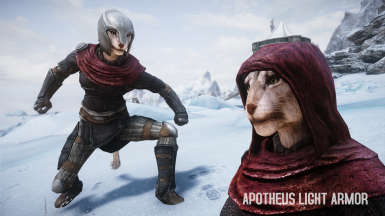 A collection of my armor mods here from years ago, Apotheus Light Armor with an updated Blooded Heavy Armor, and the latest set I've created the Duskward's Armor Set. For some reason the esp file was not reading the 100 weight meshes of Duskward - Dark set, leaving that version with no weight slide above 0. Hopefully this finally fixes the problem. v1.1.2 Loose Files still compatible with latest version. 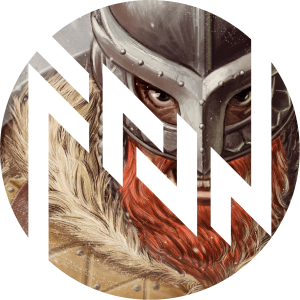 v1.1.0 DSR patch still compatible with the latest version. 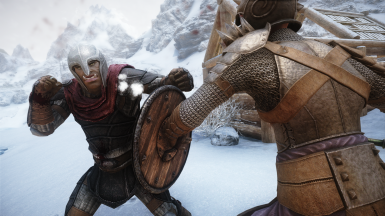 Treated bsa/bsl files like it worked the same as in SkyrimSE, thinking the esp can be edited with no negative effects between archived files. Repacked the files and uploading loose files as well. Overlooked 1st person view of Duskward Gloves dark version still set to use now deleted models making it not appear in-game. Fixed to set in line with the changes from 1.1.0 to use dark texture sets. While fixing gloves, noticed other overlooked 1st person arms of Duskward Armor - Dark still not using Texture Set. Fixed as well. EACH ARMOR SET REQUIRES A JOURNAL TO BE IN YOUR INVENTORY AND ADVANCED ARMORS SMITHING PERK FOR THEM TO APPEAR IN THE CRAFTING MENU OF FORGES OR THE SKYFORGE (More details below). TEMPERING (Workbenches & Grindstones) THE PIECES YOU HAVE ACQUIRED OR CRAFTED DOES NOT REQUIRE THE JOURNALS. ALL ARMORS HAVE MODELS FOR WEIGHT SLIDER, AVAILABLE FOR MALES & FEMALES OF ALL PLAYABLE VANILLA RACES. 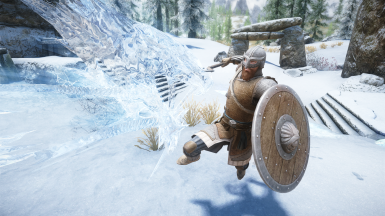 This mod comprises of three armor and/or matching weapon sets. My first armor mod Apotheus Light Armor, well, my first that's mostly made from scratch. I've long deleted my real first which was just a retexture of mashed up pieces from the game. I haven't done any changes to this set, as I find it difficult to go back on old projects. Being My first, it has many flaws in my eyes, having learned better modeling techniques. If I had to work on it again I'd have to throw away most of the 3d assets to start all over, and I don't have the time for that right now. I really only included this for the base lore I established. Apotheus armor is actually a part of hothtrooper44's Immersive Armors, so in the file section there are 2 choices for the main file, one includes the Apotheus Armor (Incompatible with Immersive Armors) and one that does not (Compatible with Immersive Armors). Choose only one. My second armor mod the Blooded Heavy Armor that I created to match the Targe of the Blooded shield already found in-game. 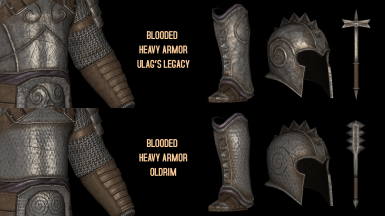 I reworked the blooded armor meshes and textures a bit after learning more on proper/practical and historical armors from youtubers like Knyght Errant, Skallagrim and Shadiversity. This was where I initially planned for my 2nd run with modding to stop... But having myself opened to a more enlightened perspective on the subject, I found myself with a new drive to create another custom armor that is more grounded in history. Enter my latest design, highly inspired by Scandinavian and 13th century knight armors, the Duskward Light Armor follows/continues the lore I established for the Apotheus Light armor that circles around the unfortunate and late Ulag. 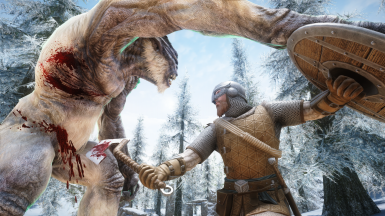 Skyrim's anatomy/proportions and my limited modeling skills. My idea for this, being a light armor, that it will be something you can put on and strap in easily without any aid like most full plate armors. 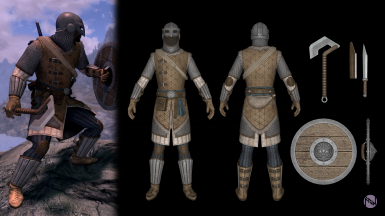 As before I tried to design an armor that looks like it will easily fit the world and theme of TES V, that is practical, not too tacky and actually viable to be worn and move around in if it was ever made in real life. Each armor set has a corresponding journal that needs to be in your character's Inventory for that set to appear in the list of craftable items when using forges or the Skyforge. But don't worry, I made it so that the journals can't be sold to merchants. So you can either always keep them in your inventory or store them in a safe, non-respawning container you can remember. This also serves to avoid flooding the list of items in the crafting menu, as you most likely have many other mods that add new craftable items. 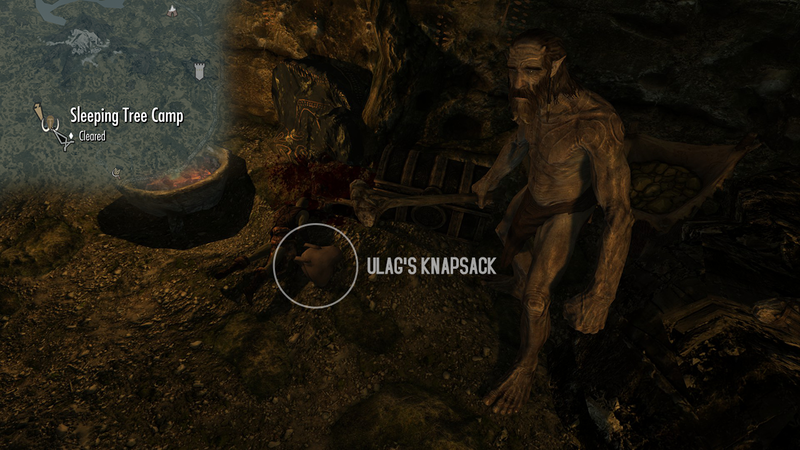 In a Knapsack beside the dead body of Ulag found in the Sleeping Tree Camp/Cave﻿ along with its corresponding notes on how to craft it, Ulag's Journal. Only craftable at the Skyforge﻿. Worn by Umana﻿, a redguard woman found in the last chamber inside Alftand cathedral. Enchanted set (with "the" prefix before blooded, e.g. The Blooded Boots, The Blooded Gloves, etc.) Only craftable at the Skyforge. Unenchanted set (no prefix before blooded, e.g. Blooded Cuirass, Blooded Helm, etc.) craftable at any forge. the Targe of the Blooded can also be improved at the Skyforge. 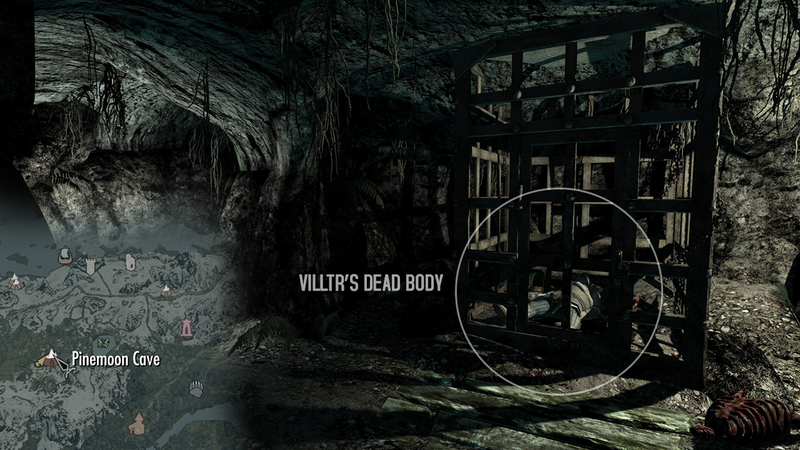 Worn by a dead NPC, Villtr the Unsung, that I placed in the once empty cage at the last chamber/room of Pinemoon Cave﻿. 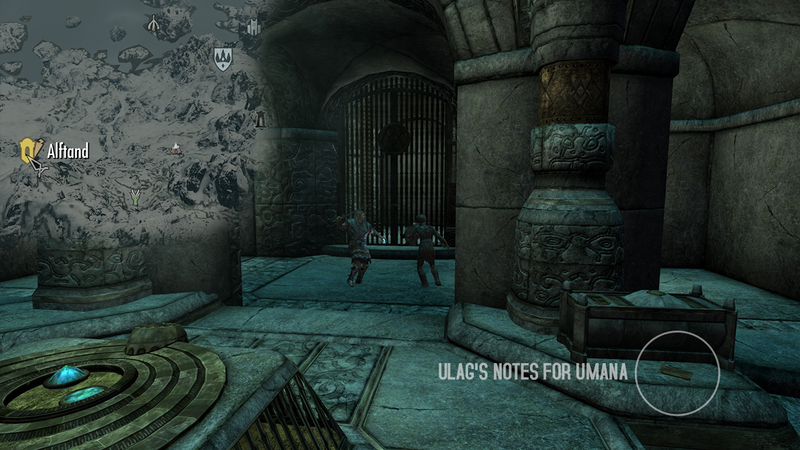 With his own accounts of his life, Villtr's Journal in his inventory, which is needed to craft the set. Enchanted set (With possessive apostrophe "s" e.g. Duskward's Boots, Duskward's Gloves, etc.) Only craftable at the Skyforge. Unenchanted set (no possessive apostrophe "s", e.g. 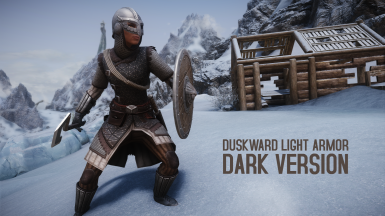 Duskward Armor, Duskward Helmet, etc.) craftable at any forge. Dark version of both Enchanted and Unenchanted set also craftable at either the Skyforge or any forge respectively. One form of balancing I made is the need for three (3) rare ingredients due to the lore I created for the process of crafting these sets. Which are Fire Salts and Frost Salts for almost any piece with Steel parts and the Sleeping Tree Sap for almost any piece with organic based parts (leather or wood). UESP ARMOR﻿ AND WEAPON﻿ LIST FOR COMPARISON. Reflect 5% of melee damage to attacker. 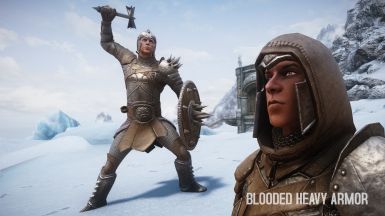 Increases Speech Articulation by 25% when wearing the complete The Blooded armor set. Fortify Archery by 30%. Increases Speech Articulation by 25% when wearing the complete The Blooded armor set. 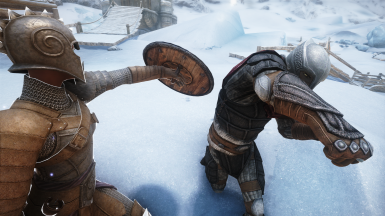 Reflect 5% of melee damage to attacker. Health regenerates 25% faster. Fortify Heavy Armor by 25. Fortify One-handed by 30%. Block 30% more damage. Unarmed strikes do 15 additional damage. 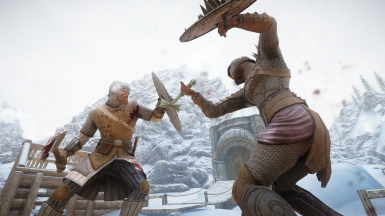 Reflect 5% of melee damage to attacker. Stamina regenerates 25% faster. Move 15% faster in combat (only walk/run speed not attack speed). Bashing does 5 points bleeding damage for 5 seconds. The improvement motivates you to bash more, stamina regenerates 25% faster. This fast swinging mace has a stronger stagger and a chance to either paralyze for 1 second or slow the target for 5 seconds. Wearer is muffled by 30%. Stamina regenerates 30% faster. You take 30% less damage from falling if wearing the complete Duskward's Armor set. The full tang reduces the effort of weilding (Absorb 30 Stamina) the axe making it swing faster, while the exceptionally sharp blade does extra 3 bleeding damage for 5 seconds. 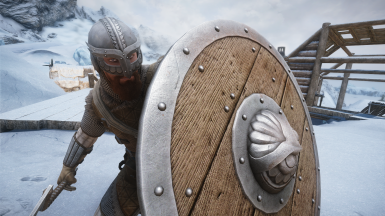 Armor rating doesn't really matter much in the long run, since with all the possible ways in-game to increase smithing skill, any armor can reach the armor cap. Use either Mod Organizer 2, Vortex, or Nexus Mod Manager (if that's still a thing) for easy Installation and activation. For Manual installation, simply place the .esp and .bsa files in the games Data folder and activate via game launcher. Before uninstalling, unequip any enchanted sets in-game to avoid leaving any possibly permanent magic effects on your characters. Then remove/delete the .esp and .bsa files. I do art commissions whenever I can.